Pgh Momtourage: Free Mug Offer! Do you love finding unique & personal gifts? 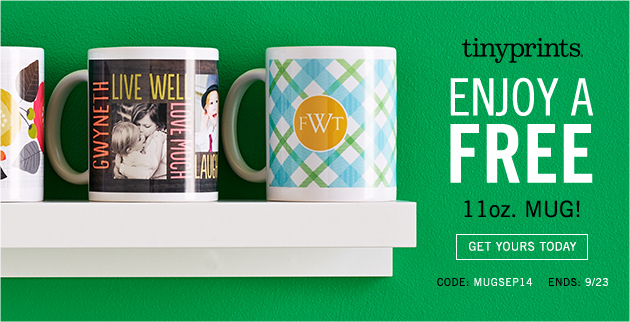 Tiny Prints is offering a FREE personalized mug through Tuesday! You have 3 options for personalizing these pretty mugs! Custom Mug with Photo: Add favorite photos to your morning coffee. Custom Mug without Photo: Decorate with exclusive designs. Custom DIY Mug: Channel your inner designer. Use Promo Code MUGSEP14 at checkout. Go here to order. Offer expires Tuesday, September 23, 11:59 (PT). You will have to pay shipping which may vary (it was $7.95 for me), but these cute mugs usually start at $15.99, so still a great deal! I am an affiliate with Tiny Prints, thank you for your support of the Pgh Momtourage!